Archives : BEARISH BREAKOUT TO THE TRADING RANGE - 31/01/2014. BEARISH BREAKOUT TO THE TRADING RANGE – 31/01/2014. Global weakness contributed to the market opening with a gap down on Thursday, as the U.S. Federal Reserve continued to scale back monetary stimulus. It was further aided by the RBI’s decision to raise Interest rates and the expiry of January series which resulted in the market breaking the short term trading range of the Nifty between 6350 – 6130 on the lower side. Last series saw unwinding of long positions and addition of short position in Bank Nifty and other midcap stocks. Strong rollovers were seen in Apollo Tyres, Tech Mahindra, McLeod Russel, SBI and Divis Lab. Sensex opened the week at 20899, made a high of 20899, low of 20343 and closed the week at 20513. Thus it registered a weekly loss of 620 points. At the same time the Nifty opened the week at 6186, made a high of 6188, low of 6027 and closed the week at 6089. Thus the Nifty closed the week with a loss of 177 points. On the daily charts, both Sensex and Nifty have formed a small body candle with small shadows almost like a neutral formation. This is the second consecutive day of neutral candle formation. On the weekly charts both the indices have formed an Opening Black body Marubuzo. This candlestick formation comes after a Spinning Top in the previous week, hence it suggests strong bearishness. Thus both daily and weekly pattern suggests a bearish bias in the short term. A Bearish Breakaway Gap has been created on the daily (Sensex 21323-20899 & Nifty 6263-6188) as well as weekly (Sensex 21001-20899 and Nifty 6243-6188) charts. Hence one cannot expect an uptrend to resume till the above mentioned gap gets filled. Market was finding strong support in the Support zone between Sensex 20651 – 20636 and Nifty 6142 – 6140. Finally this week the market decisively breached this support zone and has managed a weekly close below this. Thus the market has now resumed its correction. Its immediate Correction levels will be Sensex 20374-20112 and Nifty 6058-5973. If the Correction intensifies then we need to look at the medium term rally from 17448 to 21483 for the Sensex and 5118 to 6415 for the Nifty. Intermediate Retracement levels as per that rally falls at Sensex 19942-19466-18990 and 5920-5767-5614 for the Nifty. From a longer term perspective, Market has a strong support zone between Sensex 19444-19264 and Nifty 5738-5688. This is a confluence zone formed by the presence of Bullish Rising Gap between Sensex 19444-19293 and Nifty 5738-5688, intermediate low of Sensex 19264 and Nifty 5700 and the 50% Retracement level which is at Sensex 19385 and Nifty 5730. Thus this is a strong Support Zone and a breach of this support zone will end the current long term uptrend. This week, both Sensex and Nifty have closed below the short term average of 20dma (Sensex – 20940 and Nifty – 6219), medium term average of 50dma (Sensex – 20902 and Nifty – 6216) and the long term average of 200dma (Sensex – 19991 and Nifty – 5971). Thus the trend in the short term and medium term timeframe has turned bearish, whereas the trend in the long term timeframe remains up. MACD and ROC both are negative and hence continue with its Sell signal. RSI (37) has gone down below the equilibrium line and hence suggests bearish momentum. MFI (61) is still above the equilibrium line. Stochastic Oscillator has given a fresh Buy signal as %K (15) has gone above %D. ADX (19) has finally increased after a gap of around 3 months, but still indicates consolidation. The Directional Indicators continue with its Sell signal as +DI remains below –DI. OBV continues in Sell mode making lower top lower bottom formation. Thus Oscillators suggests bearishness. The Nifty O.I. PCR has improved to a level of 1.34. For the Feb series, highest Open interest build up is at 6000 Put and 6300 Call. This suggests that the market expects a trading range with support coming in at 6000 levels and resistance around 6300 levels. Friday saw strong Put writing at the strike of 5900. Thus one can expect strong support at the level of 5900. The Trendline Resistance for the Sensex is at 20682. The Trendline Support for the Sensex is at 20227. The Trendline Resistance for the Nifty is at 6149. 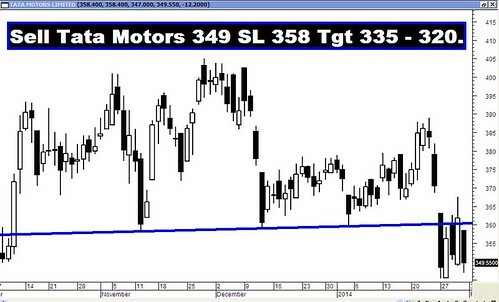 The Trendline Support for the Nifty falls at 5975. For the week ahead, Sensex will find Support at 20161-19826-19532 and will find Resistance at 20828-21123-21409. For the week ahead, Nifty will find Support at 5972-5877-5786 and will find Resistance at 6170-6263-6358. All the recommendations given in the previous week did well and reached their targets. But the Star performers of the week were PNB and Idea, which went up by more than 12% and 11% respectively.